Russian Railways CEO Oleg Belozerov addresses the forum. Today, a strategic forum for Russian gauge railways opened in Vienna with more than 400 delegates from 29 countries. This was the first time that such a 1520 strategic forum event has been held in the European Union. Its focus was how European and Russian gauge railways can accommodate the ever-increasing rise in rail freight between China and Europe which last year was 415 TEU (twenty-foot equivalent container units), a 60 per cent increase since 2016. 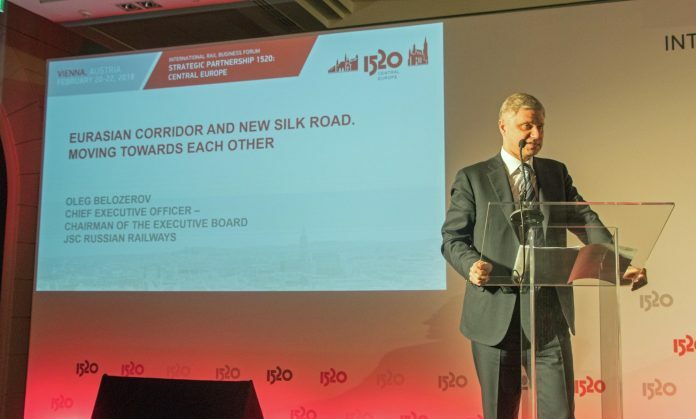 Russian Railway CEO, Oleg Belozerov advised that this was to grow to 40 million TEU by 2040. Accommodating this increase is a huge challenge, although less so for Russian Railways on which 1.5km freight trains are the norm with this transit traffic accounting for only three percent of the total. Key issues raised by various speakers are the need to increase terminal capacity, especially where there is a change of gauge. With almost all this traffic currently passing through Brest on the Belarus-Polish border, the need for additional routes was stressed. One such route is the provision of a Russian gauge route from China to Vienna by a new 500km broad gauge line from Kosice in Slovakia to Vienna. This project, which has been proposed for some time, is now looking increasingly attractive, although this would provide a route to China via Ukraine which is a member of Breitspur Planungsgesellschaft, the four-nation joint venture formed to build this line. Keir Fitch, the European Commission’s head of railway safety and interoperability, was the first speaker from the EU to have addressed a 1520 strategic forum event since 2012. He noted that European railways were a significant barrier to Euro Asian rail freight. The EU’s shorter freight trains and busy passenger lines presented a bottleneck to freight traffic from China. He described how this was being addressed by the development of European freight corridors. It was clear that all those at the conference wished to work together to accommodate the ever-increasing rail traffic from China to Europe via Russia. It will be interesting to see if this signals a rapprochement between Europe and Russia. This article was written by Rail Engineer editor David Shirres.